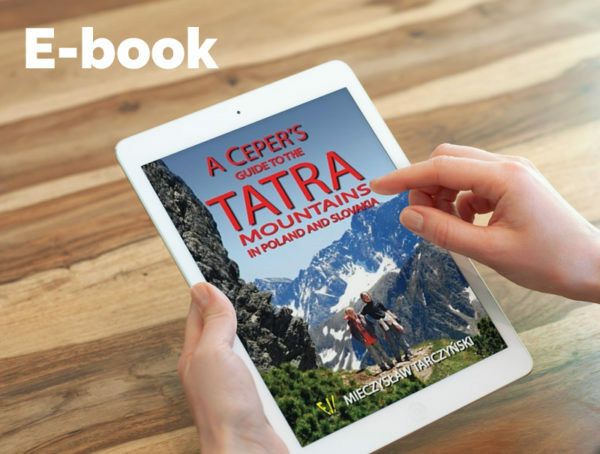 The Ceper referred to in the title of this book is none other than the author himself—a guy from the big city deeply in love with the Tatras and eager to hurry into the mountains at every opportunity to enjoy them to the fullest. In his guide the author gives us the benefit of his advice on how to wander the mountains and get from the most out of them. He describes individual trails, leading the reader by the hand and drawing their attention to stunning landscapes, notable outcrops and scree slopes. His fascination is truly infectious. A Ceper’s Guide is an original and entertaining introduction to the mountains. It is written in a very conversational and informal style, full of wit and encouragement to the reader facing new challenges. This new, ceper’s, view of the Tatra Mountains inspires the reader to think about their magic and beauty and to experience strong emotions. The author also encourages the reader to be thoughtful early in their preparations and to stay alert during the trip. Reading this guide you get the impression that it was written especially for you. You can cover the entire Tatra range with its help and track your progress climbing specific summits, hiking new trails and visiting caves and valleys. A Ceper’s Guide will help you find what people have been seeking in the mountains for centuries: enrichment of the self and the true experience of the wanderer. Along with the author, we would like to caution you to choose your route carefully according to your abilities, fitness and health. Out there, high in the mountains, unexpected and difficult situations can happen and we should all be aware of this every step of the way. In the mountains there is no one to take responsibility for you but yourself.